The Cleveland Museum of Art is truly a treasure here in Northeast Ohio. This world-class museum is free and open all year for families to enjoy. Here is more about the museum from the Cleveland Museum of Art website: “The museum opened on June 6, 1916, after many years of planning. Its creation was made possible by Cleveland industrialists Hinman B. Hurlbut, John Huntington, and Horace Kelley, all of whom bequeathed money specifically for an art museum, as well as by Jeptha H. Wade II, whose Wade Park property was donated for the site. The endowments established by these founders continue to support the museum. The original neoclassic building of white Georgian marble was designed by the Cleveland firm of Hubbell & Benes and was constructed at a cost of $1.25 million. Located north of the Wade Lagoon, it forms the focus of the city’s Fine Arts Garden. Frederic Allen Whiting was the museum’s first director from 1913 to 1930. An authority on handicrafts, he believed in the museum as an educational institution. Under his leadership, the museum established the education department and a wide variety of programs for children and adults. In 1919 the first “Annual Exhibition of Cleveland Artists & Craftsmen” was held. This exhibition soon became known as the May Show, and continued to showcase local artists for 73 years. William M. Milliken served as the museum’s second director from 1930 to 1958. During his tenure the museum continued to prosper, particularly during the 1940s and 1950s, when a series of large bequests, including the Rogers Bequest and the Severance Fund, allowed the purchase of significant works that established the museum’s international reputation. Three important milestones occurred in 1958. On March 4 the first major addition doubled the size of the museum. During the year the museum also received a sizable bequest from Leonard Hanna Jr., which provided the funds necessary to function in the mainstream of national and international art collecting. Dr. Sherman Emery Lee became the museum’s third director. Lee would be known for his long tenure in the director’s role and the development of the museum’s Asian collection, which ranks as one of the finest in the country. During his directorship another wing, developed by signature architect Marcel Breuer, opened in 1971. It contained special exhibition galleries, classrooms, lecture halls, Gartner Auditorium, and the headquarters of the education department. In 1983 Dr. Evan Hopkins Turner became the fourth director. Another addition to the museum opened during his tenure. It contained the museum’s extensive library, as well as nine new galleries. Turner’s legacy includes the expansion of the photography and modern art collections and the reinstallation of permanent galleries. He also established the museum’s community-centered focus to ensure the institution’s relevancy to its audiences. Turner’s community-centered outlook continued under the directorship of Dr. Robert P. Bergman, who served from July 1993 until May 1999. A specialist in the art of the European Middle Ages, Dr. Bergman established community advisory committees to act as consultants for exhibitions and programs. Upon the untimely death of Dr. Bergman, deputy director Kate Sellers was appointed acting director and served from May 1999 until March 2000. On March 13, 2000, Katharine Lee Reid, the daughter of former director Sherman Lee, became the museum’s sixth director. Her special interests included 17th-century European paintings, 20th-century painting and sculpture, and late 19th- and 20th-century American and European decorative arts. Under her tenure, ground was broken for the Rafael Viñoly-designed renovation and expansion of the entire museum complex. Mrs. Reid retired in 2005. Succeeding Katharine Lee Reid in April 2006, Timothy Rub became the seventh director of the museum. With a background in architecture and modern and contemporary art, Mr. Rub brought 20 years of museum experience to Cleveland. The museum’s renovation and expansion project continued under Mr. Rub, with the renovated 1916 Beaux-Arts building reopening in June 2008 and the new east wing in June 2009. Mr. Rub resigned as director in September 2009 to become director of the Philadelphia Museum of Art. Deborah Gribbon, a former director of the J. Paul Getty Museum, served as interim director until September 2010. David Franklin, an internationally respected scholar of Italian Renaissance and baroque art, was the museum’s ninth director; his term ended in October 2013. Fred Bidwell, the retired executive chairman of JWT/OgilvyAction, a national advertising agency serving leading brands with more than 500 employees, served as the museum’s interim director. William M. Griswold was named the tenth director of the museum in May 2014, and is currently leading the museum as it approches its centennial anniversary”. From Wikipedia: “Wade Park is a park in the University Circle neighborhood of Cleveland, Ohio. An idyllic swath of land in one of Cleveland’s busiest neighborhoods, the park was built on land donated by Jeptha Wade with the intention of using part of the property building for an art museum. 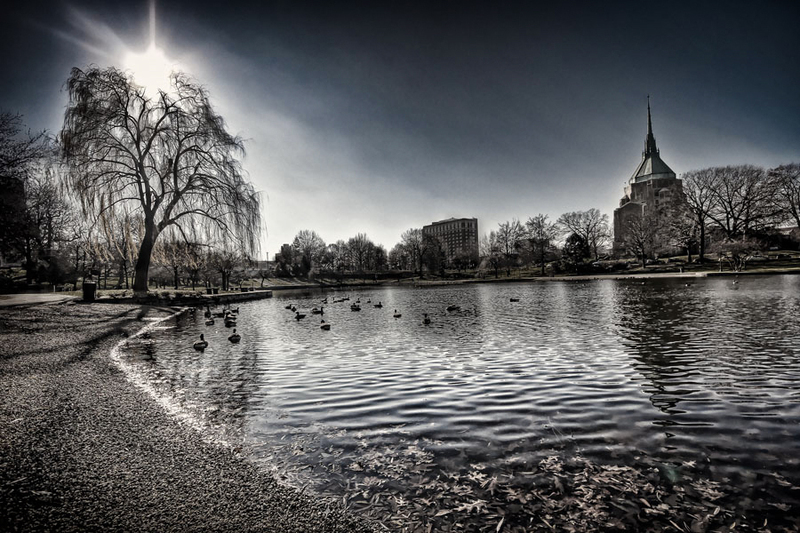 Its most prominent feature is the Cleveland Museum of Art and the adjacent Wade Park Lagoon. 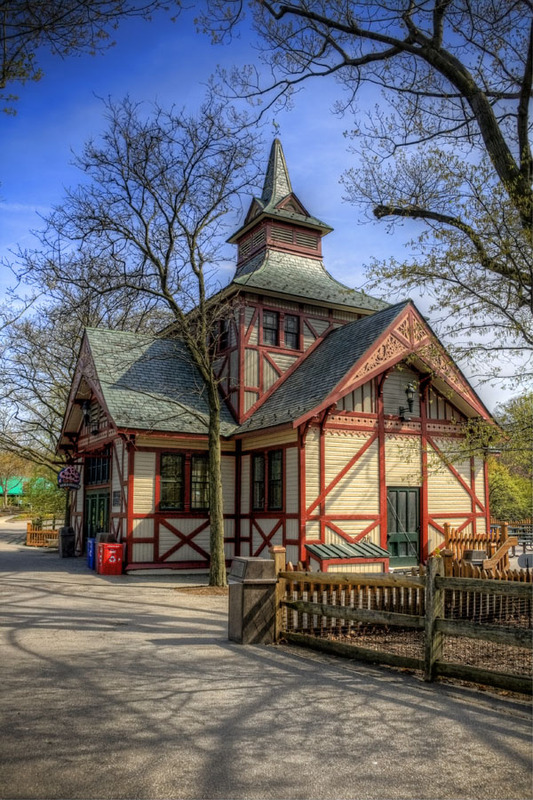 While not technically a historical landmark on its own, the park falls within the eponymous Wade Park historical district and essentially serves the landscape for most of the buildings included in the registry entry. 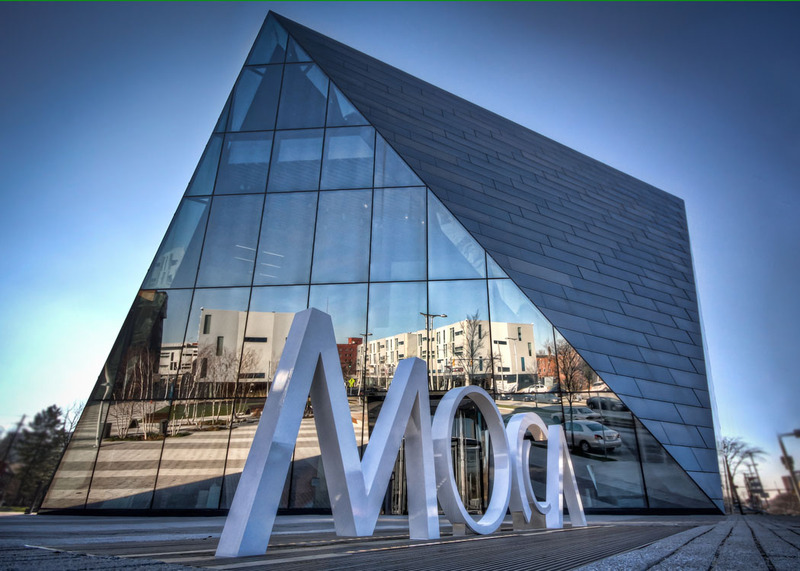 “MOCA’s new building is designed to serve as a catalyst for creativity and growth in a cosmopolitan Cleveland neighborhood, which is home to one of the country’s largest concentrations of cultural, educational and medical institutions. The nearly 34,000-square-foot structure, which is 44 percent larger than MOCA’s former rented space, demonstrates that a museum expansion need not be large in scale to be ambitious in all respects. Devised for both environmental and fiscal sustainability, the design is at once technically inventive, visually stunning and highly practical. The dynamic structure was designed by Iranian-born Farshid Moussavi of London, formerly with Foreign Office Architects (FOA) and now principal of Farshid Moussavi Architecture (FMA). This is her first U.S. commission and her first museum. In addition to FMA, the design team includes executive architects Westlake Reed Leskosky, headquartered in Cleveland and designers of more than 50 cultural buildings throughout the United States. The four-story building, which anchors the Uptown district, rises 60 feet from a hexagonal base to a square top, where the primary exhibition space is located. All four floors contain areas for either exhibitions or public programs. Clad primarily in mirror-finish black Rimex stainless steel, the façade will reflect its urban surroundings, changing in appearance with differences in light and weather. Three of the building’s six facets, one of them clad in transparent glass, will flank a public plaza designed by James Corner Field Operations, a New York-based landscape architecture and urban design firm. The plaza will serve as a public gathering place and will link MOCA to Uptown attractions and amenities, including the expanded Cleveland Institute of Art, designed by Burt, Hill with MVRDV, and new commercial space and residential units, designed by Stanley Saitowitz/Natoma Architects Inc.